Three Cheers for the staff at the cemetery! They are understaffed for the size of the grounds involved, but graciously did what they could, and more than their job descriptions probably call for them to do. 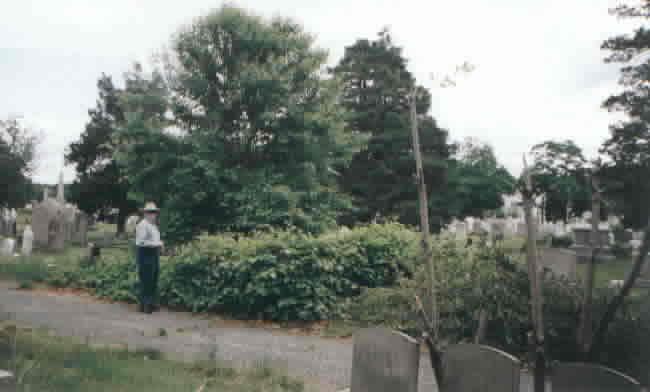 In 2001, one of the local TV channels had said they would do some news material video work at the Joseph Bucklin grave site, if we would provide some commentary. We cancelled that idea because the site as we viewed it in June 2001 simply was not something that would show any historical gravestones or reason for being there. 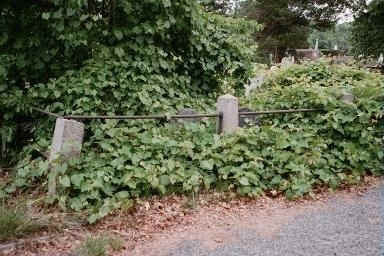 Over the centuries, the Bucklin and Sabin 1700’s graves area had a growth of trees, brush, weeds, vines, and ivy. The growth was such that the gravestones were either not able to be found or were not not readable. When we hacked into the area to find one gravestone we found that three centuries of leaves had built up about eight inches of soil and debris over the bottom part of the gravestones, so we gave up. 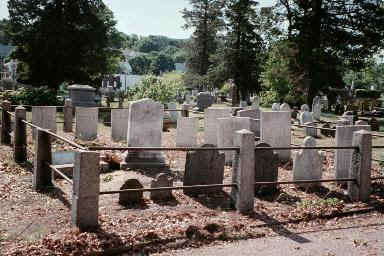 Indeed, one could not find most of the graves in the area. Here is a photo taken June 7th, 2001, after we had hacked into the area. We told the burial grounds staff that our expected publicity shots had been cancelled, and in 24 hours they took out truckloads (we mean large dump truck size truckloads) of material, including a large and old tree that was uprooting gravestones. Here is what the same area, from the same vantage point, looked like on June 8th, 2001. Here are another pair of before and after photos, which are even more startling in the difference. These “before and after” photos really illustrate the need for vigilance in preserving historical sites. Another century of neglect and these graves would have been impossible to find! These pairs of photos are NOT a criticism of what the staff did ‘before’ we arrived, but rather praise for the staff at the North Burial Ground. We investigated slightly and came to the conclusion that they are woefully understaffed and do the best that can be done. 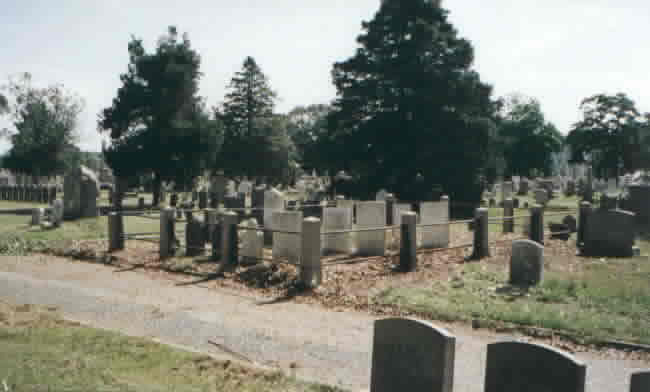 Our criticism is for the city of Providence, which does not provide much for their most important historic cemetery. After the cleanup we concentrated on that area. We found Joseph’s third child’s gravestone, that we had not been able to find the year before because of the overgrowth. 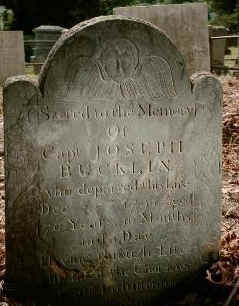 We were also able to get a good look at Joseph Bucklin 4th’s gravestone, Read more about Joseph Bucklin 4th’s gravesite.